The Gold Fever Follies -- Song, Laughter, Colour and Action! The cast of the Follies posing after the show. The storyline is new to the Gold Fever Follies, but familiar to us all -- a love forbidden because of prejudice and animosity between two factions -- in this case, two communities: Rossland and Trail. Audience members will recognize many allusions to Shakespeare's Romeo and Juliet, as well as some direct quotes, such as " No, sir, I do not bite my thumb at you, sir, but I bite my thumb, sir." There is a balcony scene of sorts, and at one point the stage is littered with unconscious bodies. Inter-tribal hostility is explored as the well-woven plot unfolds, with dance, music and song. Audience members are treated to a lively and colourful spectacle, full of deliberate and entertaining anachronisms, and invited to laugh at a few of our own foibles. Aaron James, who played Gilbert Blythe in the Rossland Light Opera Players production of Anne of Green Gables, is again the male love interest as volunteer firefighter Julian, smitten with the doe-eyed Romola, played by Alexandra Willett. Romola's lovely sister Isabella, played by Lauren Halász, is an opera singer and enchants the audience with her soaring voice. Donald Guthrie, the hapless head of Rossland's two-person volunteer fire department, is played by Ty Wright, who also appeared in Anne of Green Gables. Guthrie's formidable wife Ellen is Nadya Corscadden, with the Gold Fever Follies for her first time. The bumptious and obstructive alderman and "acting Mayor" Flute is played by Nick Heffelfinger. Amy King is "the Velvet Queen", the beautiful and imperious operator of one of Rossland's hotels of the era. Her two obstreperous employees, Gertrude and Mabel, are played by Jessica Rowat and Kirsti Hack. 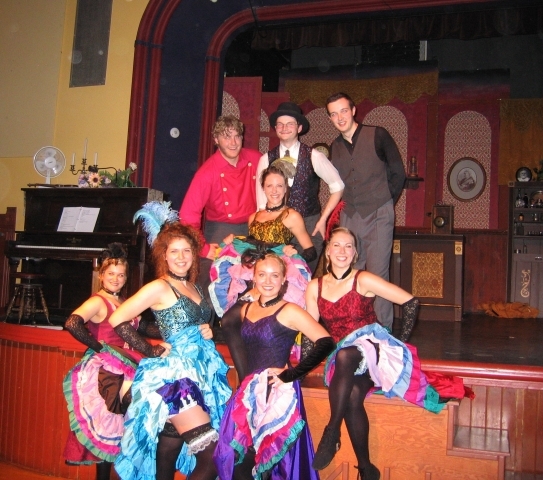 It's a Rossland institution; 2015 is the Follies' 29th season. This production is a fresh and refreshing "take" on the Follies, and everyone should go see it at least once -- and then again whenever some laughter is required, or when company arrives and some light entertainment is in order. Of course the Boomtown Garter Girls make a sassy appearance -- it would hardly be the Follies without them, would it? The Miners Union Hall at 1765 Columbia Avenue in Rossland is where the show goes on, Tuesday through Saturday at 3:00 pm and again at 7:30 pm, from June 30 to August 22. Admission is $13, or $10 for a senior, or $8 for a child between the ages of 5 and 12. Under five? Free.